These highlights do not include all the information needed to use EMEND CAPSULES and EMEND FOR ORAL SUSPENSION safely and effectively. 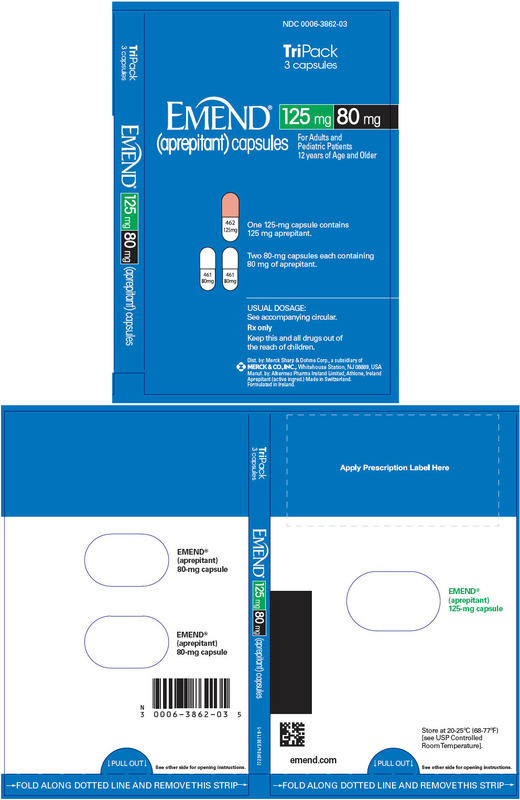 See full prescribing information for EMEND CAPSULES and EMEND FOR ORAL SUSPENSION. EMEND® is a substance P/neurokinin 1 (NK1) receptor antagonist. Chronic continuous administration of EMEND is not recommended. EMEND capsules in adults and pediatric patients 12 years of age and older: is 125 mg on Day 1 and 80 mg on Days 2 and 3. EMEND for oral suspension in pediatric patients 6 months to less than 12 years of age or pediatric and adult patients unable to swallow capsules: see dosing recommendations in Table 3 in the Full Prescribing Information. 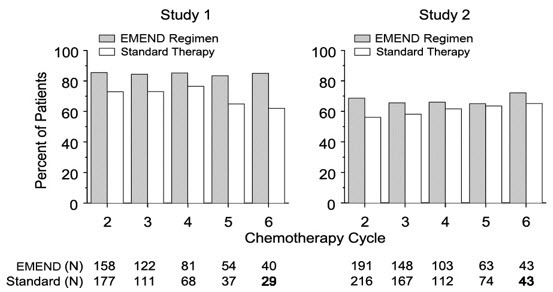 Administer EMEND 1 hour prior to chemotherapy on Days 1, 2, and 3. If no chemotherapy is given on Days 2 and 3, administer EMEND in morning. See Full Prescribing Information for recommended dosages of concomitant dexamethasone and 5-HT3 antagonist for HEC and MEC. Adults: 40 mg EMEND capsules within 3 hours prior to induction of anesthesia. EMEND for oral suspension should be prepared by healthcare provider. 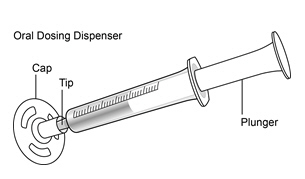 Once prepared, it may be administered either by a healthcare provider, patient, or caregiver. For details on preparation see Full Prescribing Information. Adults (≥3%): fatigue, diarrhea, asthenia, dyspepsia, abdominal pain, hiccups, white blood cell count decreased, dehydration, and alanine aminotransferase increased. Pediatrics (≥3%): neutropenia, headache, diarrhea, decreased appetite, cough, fatigue, hemoglobin decreased, dizziness, and hiccups. Adults (≥3%): constipation and hypotension.